The OnePlus 5, which is one of the most anticipated smartphones of this year, has leaked several times before. The phone leaked via some alleged renders, cases, online listings, etc. Well, the Oneplus 5 was spotted on AnTuTu today that revealed the key specs of the device and also confirmed some of the previously leaked specs. Starting off with the display, the phone features a 5.5-inch display, and it is weird that AnTuTu listing revealed a 1080p screen. So, is the company sticking with just a Full HD display for a flagship smartphone? Anyways, coming to the processor, the phone is powered by a Snapdragon 835 processor along with the Adreno 540 GPU which means it is the third smartphone to come with the Snapdragon 835 processor after the Galaxy S8 and Mi6. There is 6GB of RAM and 64GB ROM as per AnTuTu, but there are rumors that an 8GB variant will launch too. At the moment, we are sticking with the fact that the OnePlus 5 has 6GB of RAM. Now, the listing didn’t reveal whether the phone has dual camera setup on the back or not, but all the previous leaks have suggested that the phone does feature a dual rear camera setup. AnTuTu listing reveals 16MP rear and 16MP front-facing camera. Android 7.1.1 runs out of the box. Now, this listing has once again given rise to a lot of doubts. 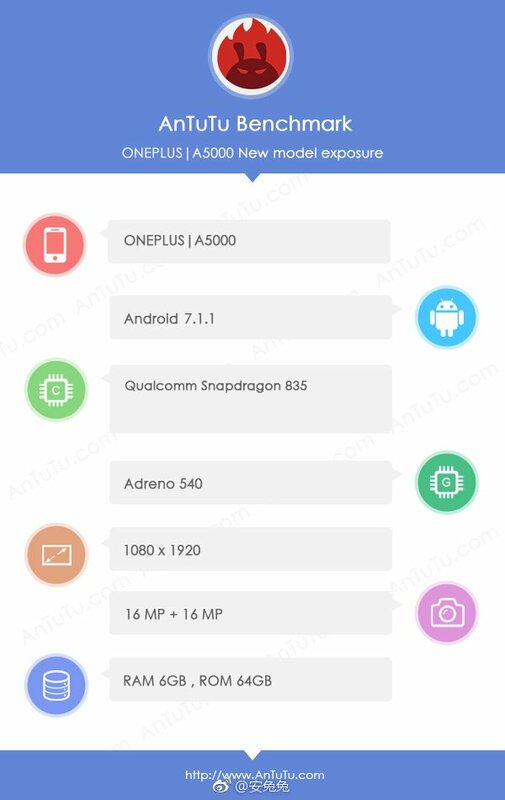 First of all, the specs seem to be of the OnePlus 3T with just the processor and GPU being changed. Also, the phone is shown to have a 1080p screen which doesn’t seem possible as Full HD is now a thing of past of the flagship smartphones. We will suggest taking this leak into consideration with a pinch of salt. Stay Tuned for more leaks.